It's been a busy week, so no planning for now. Tonight's dinner continued the quest to work through the inventory. Lettuce, not a favorite around here, was the main target. Based on a lunch I had at work this week, we made a lettuce / noodle salad. 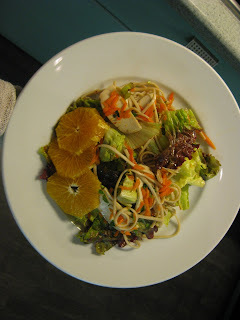 In addition to the red leaf lettuce, we made our way through a navel orange, smoked tofu, baby carrots, mint, cilantro, and a box of spelt udon. Toss all ingredients together and serve! I'd give this a 6 out of 10 as is. If we were to try it again, we'd switch to some type of Vietnamese peanut sauce and neutral tofu. Combine all sauce ingredients and reduce by half.